FileZilla is one of the most commonly used FTP clients thanks to its rich-featured and user-friendly interface. You can download the latest stable version available from their official website. Open FileZilla, click the File menu, then click Site Manager. The Site Manager screen will display any existing connections you have set up. Click the New Site button and type a name to help you identify your FTP connection. 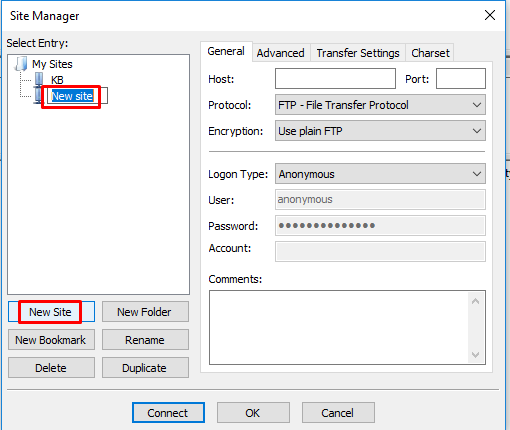 Host: Enter ftp.<your domain name>. For example, if the website you want to upload is sugen.my enter ftp.sugen.my . Protocol: From the dropdown menu, select FTP - File Transfer Protocol. Encryption: From the dropdown menu, select Only use Plain FTP. User: Enter your FTP account username. If you are using your master FTP account, this will be your domain username. Password: Enter your FTP account password. Select the Transfer Settings tab and select Passive. Click Connect. You can drag files from the Local Site pane, on the left hand side, to the Remote Site pane on the right, to upload them.